stalking prey in the surf on Captiva Island, Florida. Gorgeous picture. You can almost see each feather. Hi Tink, did you get your feet wet taking this pic? Very sharp! That is the first time I have seen a great blue heron in the surf. What a magnificent shot! 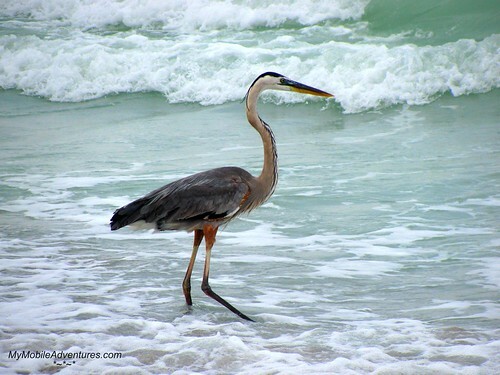 I love herons but I also love Captiva — Iwas not overly fond of Florida until I found Captiva and Sanibel! Thanks for sharing! That is a great picture. Thanks for sharing. I didn’t realize the Heron would venture into the surf! You captured a great photo. What a beautiful blue heron, how lucky that you were able to take such a wonderful picture. Thank you for sharing. Wow! What an amazing photo of a beautiful bird. Gorgeous, gorgeous gorgeous! Worth playing hooky, for sure. Great photo. The heron is very well posed and centered, and the waves are very clear as well. Here on the Westo Caost I get a Blue Heron in my yard every now and then, they are spectacular aren’t they. Wonderful heron photo. The Florida great blues look different from the west coast ones. Beautiful picture. Happy Earth Day and Happy Outdoor Wednesday! love this photo looks like the blue heron is enjoying his swim. Gorgeous! The colors of the heron & the ocean water are just stunning. 🙂 Happy WW! Mine is up here. Frame that photograph. You certainly have a passion for photography. Keep on shooting. Good job! This is amazingly beautiful picture. Now that’s a great shot for Earth Day! Thanks for sharing it! Fantastic shot. Good job. Thank you so much for sharing. Happy Earth Day! That is a GORGEOUS GORGEOUS shot! WOW! That bird is huge! He could stalk about anything he wanted! Sounds like a great hooky day! Great choice for today’s OW! Awesome picture of that heron! Nice fowl! she posed elegantly for your camera. AWESOME! I definitely wanna play hookey… especially if I can see sights like this.